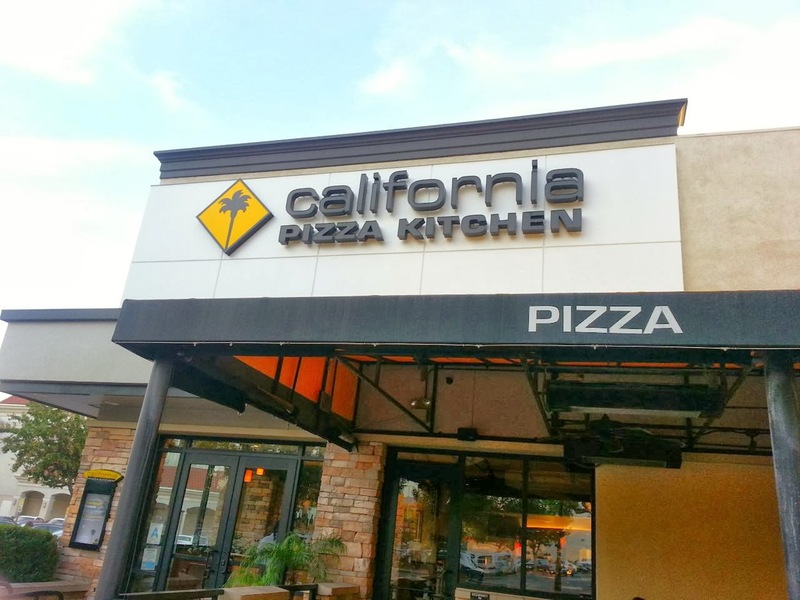 I have a long history of eating at California Pizza Kitchen. The first time I ate at CPK was in Palm Springs when I was in high school and my parents and I were on vacation in California. I ordered the Five Cheese and Fresh Tomato pizza, and I loved it. We didn't have CPK where I grew up in Ohio, but when I moved to Burbank after college, I remembered how amazing CPK was, and it became one of my regular restaurants. 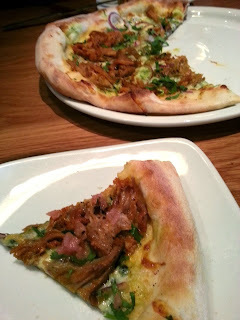 My husband and I ate at the CPK at Hollywood & Highland on our second date before seeing a movie at the El Capitan. In fact, every time we've seen a movie together at the El Capitan, we've eaten at that CPK. If you're a tourist in L.A., you have to check it out. There's a great view of the Hollywood Sign from there, and it's just down from the Chinese Theater. At a post-production company I worked for years ago, we used to have lunch catered, and sometimes we'd get food from CPK. That allowed me the opportunity to try a lot of their menu items that I otherwise wouldn't have tried, like their salads and sandwiches. Their BBQ Chicken Salad is a definite winner that I've tried to replicate at home. 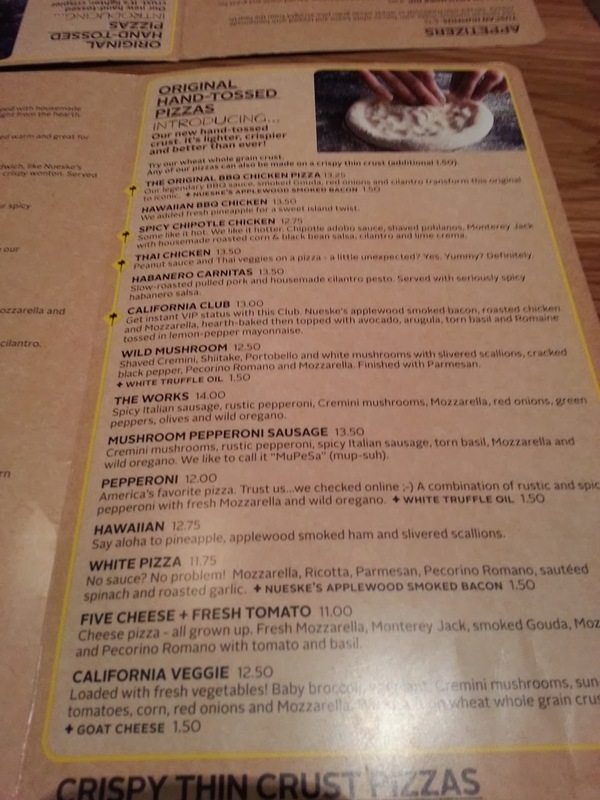 I've never had a pizza at CPK that I didn't like. I love that their pizzas are somewhat unusual. Of course, you can just get pepperoni if you want, but to me, that defeats the purpose. My first "usual" was the veggie pizza on whole wheat crust. It's currently called the California Veggie, but I think it used to have a different name like "Vegetarian with Japanese Eggplant" or something like that. 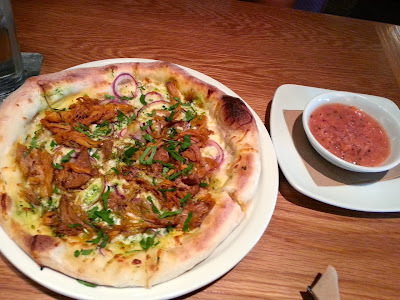 More recently, my "usual" has been the Spicy Chipotle Chicken pizza. I like a little heat to my food, and this pizza has the perfect amount of spice. I also like the Original BBQ Chicken (yup, they thought of it first, folks), the Wild Mushroom and the White Pizza. 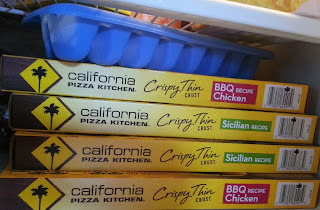 My husband and I are frequent buyers of CPK frozen pizzas. 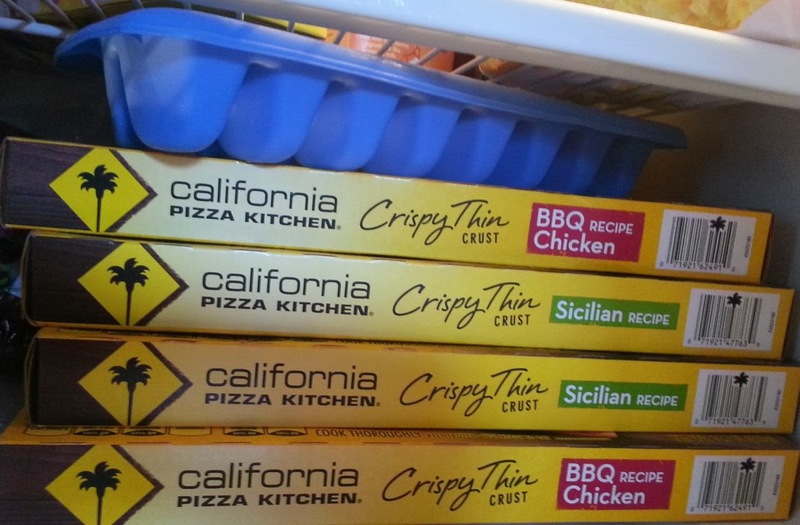 It's the only frozen pizza worth buying. We've tried at least half a dozen different kinds, and we probably eat one at least once or twice a week with my Everday Salad on the side. Our current favorite is the Crispy Thin Crust Sicilian pizza, but the BBQ Chicken and White pizzas are really good too. One nice thing about the crispy thin crust frozen pizzas is that you bake them directly on the oven rack. It makes the crust so flaky and crispy. Yum! It's definitely our I-don't-feel-like-cooking go-to dinner solution. Because we eat CPK frozen pizzas so often, we don't dine in at CPK very often anymore; however, yesterday, for Veterans Day, we decided to take advantage of their Veterans Day deal where all active duty military and veterans could get any pizza on the menu for free. We drove over to the CPK in Northridge. I love the outdoor patio at this location, but on this particular occasion, we sat at a booth inside. I enjoyed having a view of the pizza oven. It's always nice to actually watch the people preparing your food and know that they're not hiding anything. I could see how fresh the dough was because I watched them hand-toss it. I also saw them move the pizzas around in the pizza oven. It was pretty cool. Our waitress was really friendly and offered to bring bread to our table while we looked over the menu. They've changed their bread recently. It used to be tasteless and came with rock hard butter. 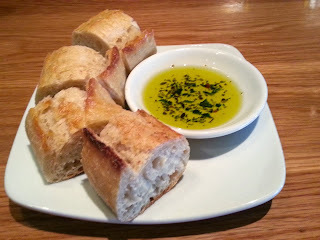 Now it tastes fresh and fluffy and comes with olive oil for dipping. 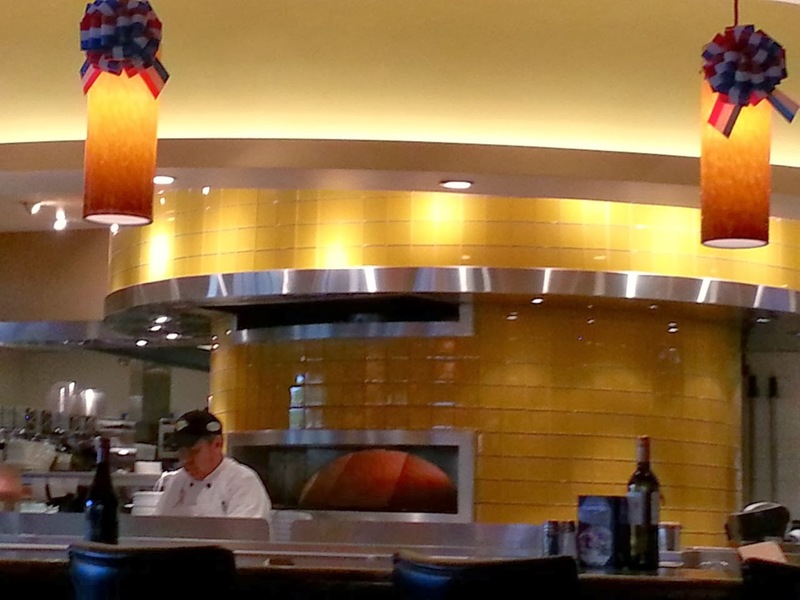 That makes CPK seem more like a classy Italian restaurant than a mid-level chain. I always like trying something I've never had before, so we decided to share the Habanero Carnitas pizza which is described on the menu as "slow-roasted pulled pork and housemade cilantro pesto served with seriously spicy habanero sauce." First of all, when they say "seriously spicy," they mean it! I love spicy food, but just a tiny amount of this sauce was enough to get my tongue tingling. The pizza was really, really good. I would totally order it again, and it tastes much better than the frozen CPK pizzas my husband and I eat so often. Although I'm sure we'll still buy the frozen pizzas, it's worth dining in at CPK to experience the light and fluffy crust. My husband didn't eat all of his crust. He just ate up to where the toppings end. I'm a carb addict at heart, and I liked the crust so much that I finished off his crust. Yup, it's that good. The pork and cilantro pesto were an excellent combination as well. If you don't like spicy food, just ignore the habanero sauce, and you'll be fine. They're nice enough to serve it on the side so you can choose your own level of heat tolerance. Overall, it was a great meal, and I look forward to my next visit. I see that CPK is currently doing a holiday gift card promotion where if you buy $100 in gift cards, they give you another $20 gift card. I know it's better to give than receive, but getting a free $20 gift card for yourself while you're giving doesn't hurt, and really, who doesn't like pizza? This is a great gift for the person who has everything. I think I even saw that CPK has a gluten free pizza, so really, it's a good gift for everyone.